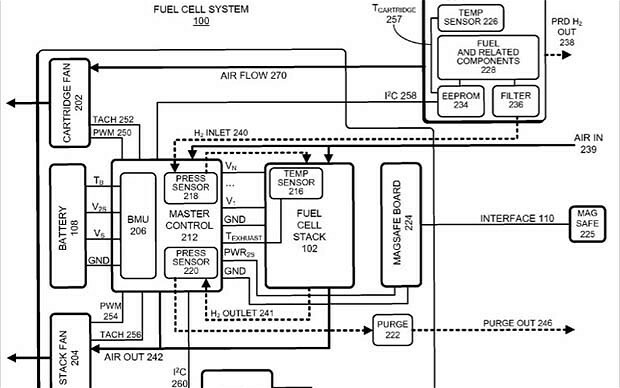 Apple Planning Fuel-Cell Powered iPhone Battery? Apple have been developing fuel-cell technology to power portable computers, such as the Macbook and iPhone according to two new patent applications submitted to the US Patent & Trademark Office. The two patents, entitled “Fuel Cell System to Power a Portable Computing Device” and “Fuel Cell System Coupled to a Portable Computing Device”, mark a future direction for battery technology that could allow battery life to extend for weeks, rather than days, as well as allowing for smaller and lighter devices. Apple noted that these issues have led to an increasing desire on the part of consumers for green, renewable energy sources.